What you should be looking for in a juicer is the high performing power which the Kuvings juice extractor is best known for. It has a 350 watt motor with up to 11000 rpm speed. This comes in handy when slicing, crushing, grating and blending even the hardest fruit. The high speed sees to it that this is done all within a matter of the shortest time possible. The Kuvings NJ-9500U Centrifugal Juice Extractor has two speed levels all for your convenience; high and low. This allows you to have your fresh fruit juice ready according to your convenience and preference. The high speed comes in handy especially for the busy people as it makes the blending process faster. The low speed performs at 9500 rpm while the high speed performs at 11000 rpm. At the top of this centrifugal juicer is a large feeding tube. This wide and large tube is specially designed to accommodate fruits of different sizes with ease. This means that it can even take up whole fruits with no problem at all and still produce the finest juice. This unique feature save you time in pre-cutting fruits before blending. The safety locking arm system comes in handy in holding the centrifugal juicer in place during performance. This is an important factor as running it with parts not held in place might ruin it or not perform at its best. Ensure that the lock is in place and every part secured where it should be. This is for convenience and easy juicing. The mesh screen is made of numerous fine holes which see to it that the juice is perfectly blended. Big fruit slices can easily be reduced to small portions gradually which the end results to the fine juice. This feature also ensures that the fruit fibers are all used in the process. The exterior of the juicer is very attractive and made of good and quality material. The removable parts all play an important role in making the juicer reliable. The design is made to ensure that the juicer performs at its best with every part firmly held in place. Its unique and superior design is a bonus to the already amazing function. 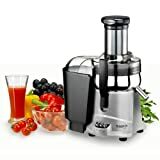 Juicer reviews have clearly gone to show that this is indeed one of the best in the market. For better performance of the Kuvings NJ-9500U Centrifugal Juice Extractor, it is advisable to peel all hard skinned fruits. Seeding the fruits is also important as it sees to it that the juicer is durable and convenient. During cleaning, remove all the removable parts and clean them separately. More attention should be on the mesh screen.